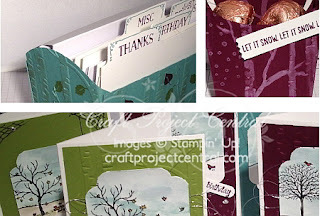 Just Julie B's Stampin' Space: Fry Box Card FIle & Treat Box! The holidays are fast approaching! Have you ever found yourself needing one more card, last minute gift, small treat, or party favor? In this tutorial, you’ll learn alternative ways to use the Stampin’ Up! Fry Box Bigz L Die to make a mini treat box that’s perfect for overnight guests’ “pillow gifts,” table favors, or hostess gifts for workshops, and a larger file box that holds note cards. This box is a perfect way to organize your fall and winter cards, and it also makes a thoughtful gift. Instructions for the cards are included in the tutorial. This would make a great class project as well! This pretty project was made by Buffy Cooper, and you can get her tutorial when you subscribe to the month of October over at Craft Project Central.